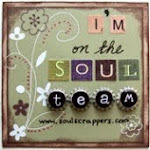 Do you ever get new stampin stuff and one product stands out to you and you just can't get enough of it!!! Well this new mini catalogue, I have a few favorites but right now it's the adorable beautiful butterfly embosslit that is for your big shot. I love love love these butterflies that emboss and cut out the shape all in one! This card I actually created for the mojo monday last wk but never got around to posting it. Thanks for stopping by and sharing a bit of my stamping world.